Congressman Tim Ryan (D-Ohio) held a rally with Fight for $15 organizers and media criticize Sen. Rob Portman's support of Republican nominee Donald Trump early Tuesday afternoon. 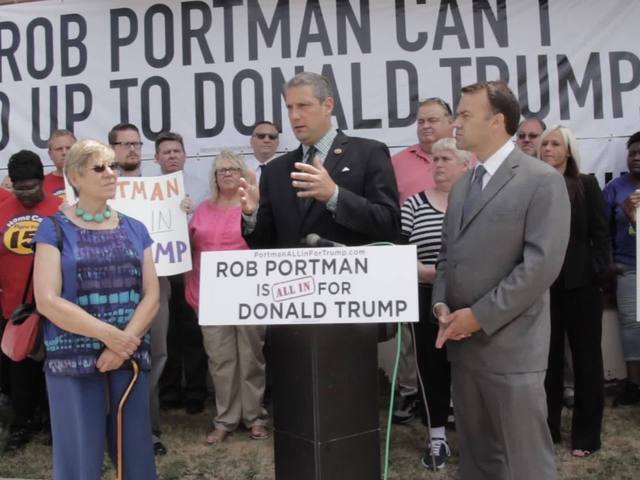 The action unveiled a banner declaring that Portman is 'All In' on a Donald Trump presidency. The congressman had speakers from the national Fight for $15 minimum wage movement who lobbed critics at Sen. Portman. Most of the criticism's called out Trump for his inconsistencies in policy, favoritism of the wealthy, and his popularity built through pop culture fame. The action took about 20 minutes and started around noon. Although there was only a small crowd of Ryan supporters and media, Trump supporters still drove by and booed the event.